Learn about the Autodiscover service in Exchange. The Exchange Autodiscover service provides an easy way for your client application to configure itself with minimal user input. Most users know their email address and password, and with those two pieces of information, you can retrieve all the other details you need to get up and running. For Exchange Web Services (EWS) clients, Autodiscover is typically used to find the EWS endpoint URL, but Autodiscover can also provide information to configure clients that use other protocols. Autodiscover works for client applications that are inside or outside firewalls and will work in resource forest and multiple forest scenarios. The Autodiscover process essentially has three phases. In phase one, you generate a list of potential Autodiscover servers, and in phase two, you try each server in your list until you (hopefully) get a successful response. If none of your candidates worked out, you move on to phase three, which represents a "last ditch" attempt to find an Autodiscover endpoint. The ExchangeService.AutodiscoverUrl method in the EWS Managed API implements all three phases of this process for you, so if you are using the EWS Managed API, you don't need to worry about implementing Autodiscover yourself. 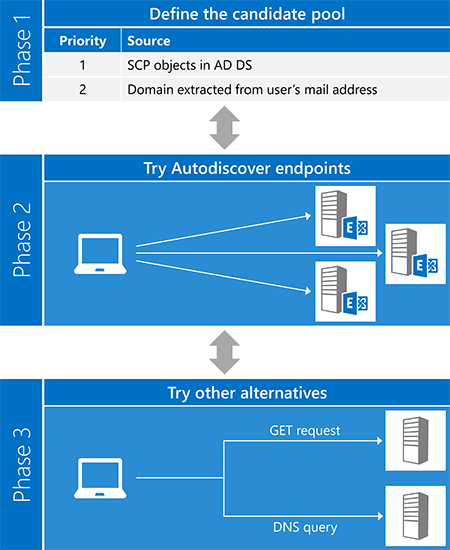 The following figure shows the three phases of the Autodiscover process. Before you can use Autodiscover, you have to locate the right Autodiscover server for your user. Luckily, Autodiscover defines a limited number of places for you to look. In the case where multiple candidates are found, Autodiscover also defines a way to generate and prioritize the list. For domain-joined clients, this is the first place to look. 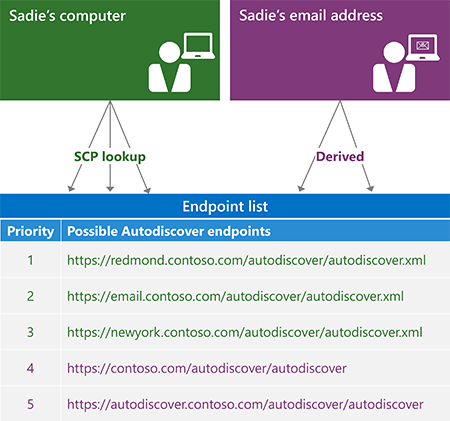 Exchange publishes service connection point (SCP) objects in AD DS, which allows Autodiscover requests to be routed to servers based on Active Directory sites. The results of an SCP lookup should be at the top of your candidate list. NOTE: SCP lookup isn't available for clients that are not joined to a domain or that do not have access to Active Directory servers. In this case, you should skip SCP lookup. The value of fileExtension depends on which Autodiscover access method you are using, SOAP or POX. The SOAP service uses a ".svc" file extension; POX uses ".xml". 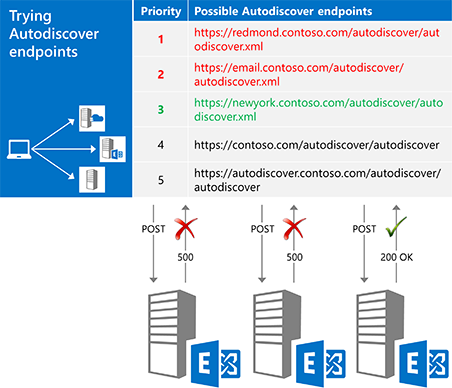 The following figure shows how to generate an Autodiscover endpoint list. After you generate an ordered list of potential candidates, the next step is try each one in the list by sending a request to the URL and validating the results, as shown in Figure 3. When you get a successful response, you're done! That the endpoint is an HTTPS endpoint. Client applications should not authenticate or send data to a non-SSL endpoint. That the SSL certificate presented by the server is valid and from a trusted authority. These are just basic security suggestions. Whenever you are working with authentication, make sure that your code meets the security requirements of your organization. The type of request you send depends on how you are accessing the Autodiscover service. An HTTP POST with an Autodiscover request body. In some cases you might try all the endpoints in your list, only to find that all of them return an error. Before throwing in the towel, you can try a couple more things: you can send an unauthenticated GET request, or query DNS for an SRV record. If these attempts also don't yield results, you cannot contact the Autodiscover service. The first thing to try is to send an unauthenticated GET request to an endpoint derived from the user's email address. The format of that endpoint is "http://autodiscover." + domain + "/autodiscover/autodiscover.xml". Note that this is NOT an SSL endpoint. If the server returns a 302 redirect response, you can then attempt to resend the Autodiscover request to the endpoint URL in the Location header of the response. If the unauthenticated GET request doesn't work out, the last thing to try is a DNS query for SRV records for the Autodiscover service. The record will take the form "_autodiscover._tcp." + domain. This query might return multiple records, but you should only use records that point to an SSL endpoint and that have the highest priority and weight. You can access Autodiscover either by using the SOAP or the POX web service. The method you use depends on your requirements and environment; however, we recommend using the SOAP web service, if possible. The EWS Managed API is also an option. It implements the client portion of both the SOAP and POX Autodiscover services. Implements the Autodiscover process for you. Uses both the SOAP and POX Autodiscover services. Works with Exchange Online, Exchange Online as part of Office 365, or a version of Exchange starting with Exchange 2007 SP1. Limited to the user settings that are available in the Microsoft.Exchange.WebServices.Autodiscover.UserSettingName enumeration. Only available for .NET Framework applications. Allows you to request just the settings you are interested in. Not available in Exchange 2007. Supported in Exchange Online and all versions of Exchange starting with Exchange 2007 SP1. Does not allow you to request specific settings.